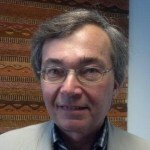 Thomas J. Csordas (Ph.D, Duke, Anthropology) is a Professor of Anthropology at the University of California San Diego. His research interests include anthropological theory, comparative religion, medical and psychological anthropology, cultural phenomenology and embodiment, globalization and social change, and language and culture. He has conducted fieldwork funded by major grants from the National Institute of Mental Health on the Catholic Charismatic Renewal movement, examining topics including healing ritual, religious language, bodily experience, and child development; and among Navajo Indians, examining topics including the experience of Navajo cancer patients, therapeutic process in Navajo religious healing, and language and narrative in interviews with Navajo patients and healers. His book length publications are The Sacred Self: A Cultural Phenomenology of Charismatic Healing (1994); (edited) Embodiment and Experience: The Existential Ground of Culture and Self (1994); Language, Charisma, and Creativity: Ritual Life in the Catholic Charismatic Renewal (1997); Body/Meaning/Healing (2002); and (edited) Transnational Transcendence: Essays on Religion and Globalization (2009).